The Baby Ball Pond is a simple Castle that the younger kids love. 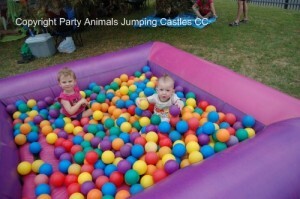 They can “swim” in the balls or run around on the edge of the unit and then leap into the balls. The base of the castle is also inflated, so there are no worries of the kids falling onto the hard ground. The rental of the balls are included with the castle rental price. The pond takes approximately 600 balls . Colours: Johannesburg has 3 Baby Ball Ponds. One pond is Pink and Purple, one is Spec Blue and Pink and the other is a red and dark blue cartoon super hero pond. The motor is a .75kw motor with a 15m extension lead. If your power supply is further than 15m from where the castle will be placed, you will need to supply an additional extension lead.